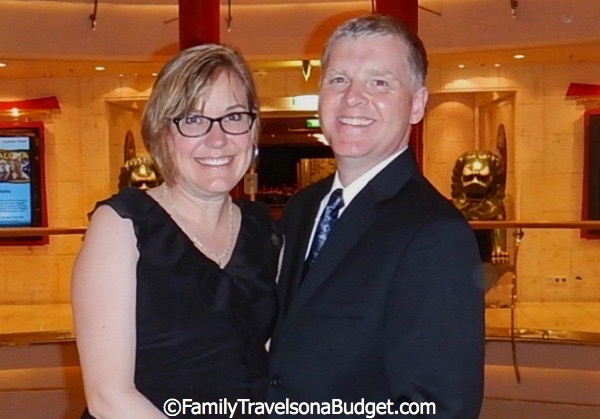 On our last cruise, a 25th wedding anniversary getaway on Royal Caribbean’s Adventure of the Seas, my husband and I met many people going on a cruise for the first time. 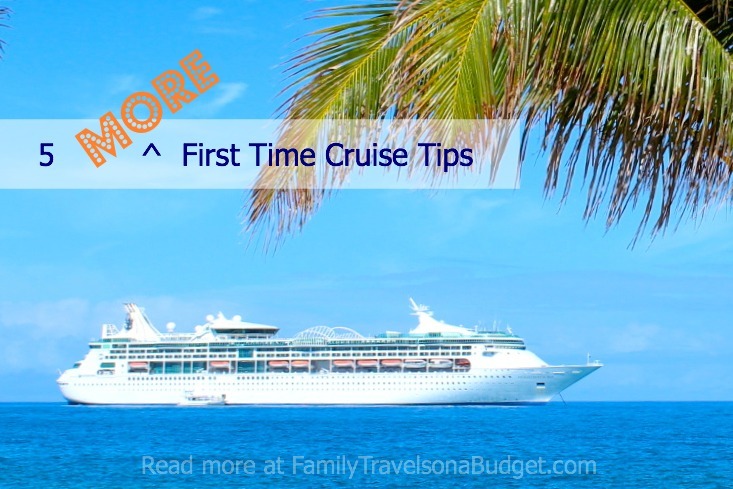 When they found out we have cruised before, they asked for first time cruise tips, often related to mistakes people make on their first cruise. But first — a cautionary tale about one of the worst possible cruise mistakes you can make — forgetting your documents and ID. In cruise planning, nothing is more important. You can replace clothes and sunscreen, but without cruise documents you’ll never make it to your first cruise! On a recent cruise, we joined a cruise travel group on Facebook to “meet” some of our fellow cruisers months before the cruise vacation. Two days before sailing, a family sent a mayday to the group, explaining that they’d left their documents and passports at home in South Carolina. Since we had to drive through South Carolina anyway, we met with one of their family members to get their cruise documents. On the morning of the cruise, we handed over their documents and gained lifelong friends. Another incident on our most recent cruise didn’t have such a happy ending. The couple had their marriage license, which is not an acceptable form of cruise identification. They were pulled from line and the last I heard, the officer was explaining to this tearful couple that they could not board. With stricter security measures in all areas of travel, there’s little (or no) room for exceptions. CRUISE TIP: Passports are the best identification for cruise travel. If unsure what you need, check with your cruise line or travel agent. Of all the first time cruise questions we were asked, this one was the easiest to answer: What should we wear for formal night on a cruise? Most cruises of three nights or longer have a semi-formal or formal night. Some people go all-out, dressed in evening gowns and tuxedos. Others don’t dress up at all, choosing shorts, t-shirts and dinner at the buffet on the pool deck. We met three families on their first cruise — three! — who did not bring dress clothes. One lady looked particularly sad, explaining she didn’t have dressy clothes at home and couldn’t afford a fancy dress so they didn’t bring any. Shop at a thrift store in a ritzy neighborhood. A friend of mine got a full sequin gown for $30 from a thrift store. She looked — and felt — stunning! Remember, you don’t have to dress in gown and tux for formal night. A dress for ladies and dress pants, shirt and tie for men is all you need. CRUISE TIP: Get our first time cruise packing list here: Click here! You’ll have everything you need! I remember (with some regret) our first cruise. 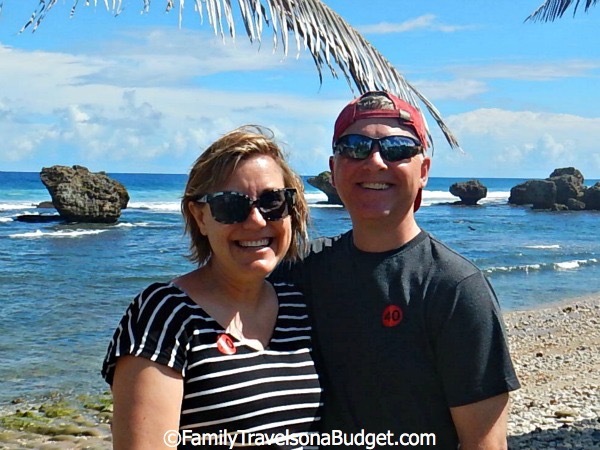 We didn’t know what to expect on a Caribbean cruise and missed out on a lot of fun. So, we didn’t take dance class, because we didn’t want to embarrass ourselves. We didn’t do a lot — all for the same reason! Silly us — free entertainment and opportunities that we let slip away. Twenty-five years later and a lot wiser, we had a lot more fun on our most recent Royal Caribbean cruise. We participated in a “selfie” race that sent us all over the ship, something we’ve never done before. Every other group was in their 20s, but guess who won! Yep! I may be pushing 50 (in less than 2 months), but I can rock a selfie, y’all! Rob’s “selfie” sleeping someplace “inappropriate.” Is the doorway of the buffet appropriate? We also took a dance class, motivated in part by our son’s upcoming wedding. And also because we wanted to try something new. You know what? Everyone in that dance class, young, old and in between, was new to dancing. We all messed up. We all had fun. That’s how to have fun on a cruise! Oh yeah, if you don’t want to do something, don’t. It’s your cruise, after all. 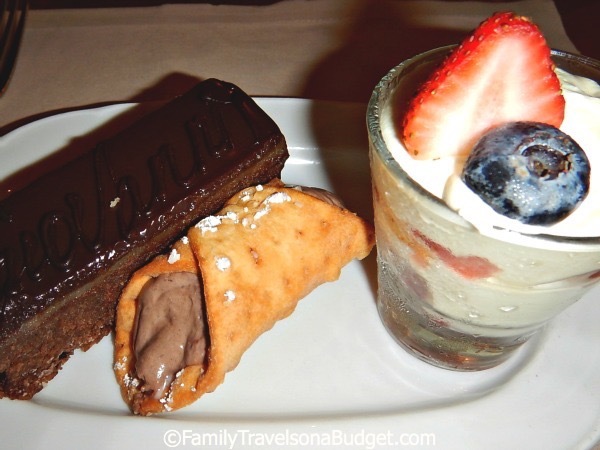 CRUISE TIP: When you eat in the dining room, if you can’t decide, order both! Like I did with dessert one night. One of the worst cruise mistakes you can make is to not tip the crew. 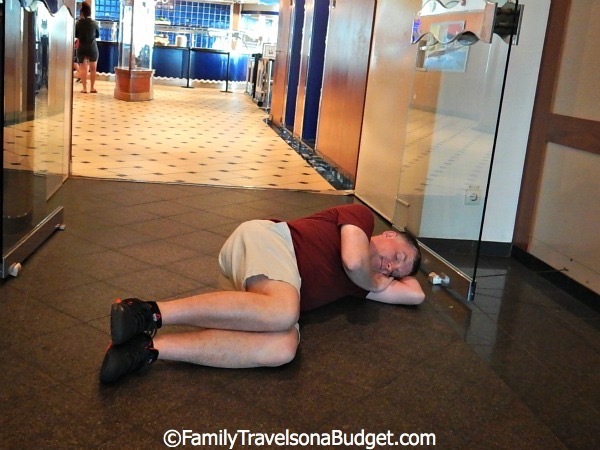 If you’re looking for first time cruise tips to save money, this isn’t the way to do it. Sorry! Most cruise lines are not US based, so they don’t have to pay staff the US minimum wage. When you skip the tip, the people serving you don’t get paid. For first time cruisers (and others who might not know), the cabin steward hauls luggage and maintains public areas around the cabins. Even those who hang the “do not disturb” sign all week still receive housekeeping services in the areas nearby. Servers work the buffet stations for breakfast and lunch, serving all guests at some point — even those who never eat in the main dining room. They do so much behind the scenes that not tipping just doesn’t make sense. Of all the cruising information and tips I can offer, this one is most important: Stick to your budget! It doesn’t matter if your budget is $2,000 or $20,000, either. Every cruise I’ve been on, the last night almost brings me to tears. People line up at customer service (LONG LINES, TOO) to dispute charges. I’ve heard, “I know I didn’t spend that much <on drinks, the casino, etc>.” It breaks my heart! All charges are electronically tracked these days, so cruise lines don’t make many billing errors. Of all the cruise mistakes people make, this is most devastating (except for not getting to board at all). On our last cruise, many people on our flight home had been on the same cruise ship. Partway through the flight, the lady across the aisle solemnly pulled her cruise charges printout from her purse. She unfolded it and dragged her finger down the list of charges — page 1, page 2, page 3, page 4, page 5. She sat, frozen, as she stared at the last page. Then she folded it up, smaller and smaller and smaller and shoved it deep in her purse. I watched (wanting to cry myself) as a tear rolled off her chin and dripped on her hand. I don’t know how much she spent — and really, it’s not the amount that matters. She clearly spent more than she planned or maybe could afford. CRUISE TIP: Track your spending on your cabin TV throughout the cruise to stay on budget. 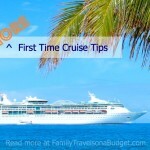 Planning a cruise for the first time? Here’s how to budget! What type of budget cushion to add to each day. Remember that tips are added to your bill at the end of the cruise (usually about $15/day per person, even kids) unless they’re prepaid. Total up that amount and you have your cruise spending planned. Adjust before travel if needed to be realistic. Cruising with teens? Try this! We tell our teens their budget for all spending for the week. AND, we tell them that whatever they don’t spend they can keep at the end of the trip. They learn some personal budgeting skills and we don’t seem like bad guys! It works great. Experienced cruisers, what do you know now that you wish you knew then? 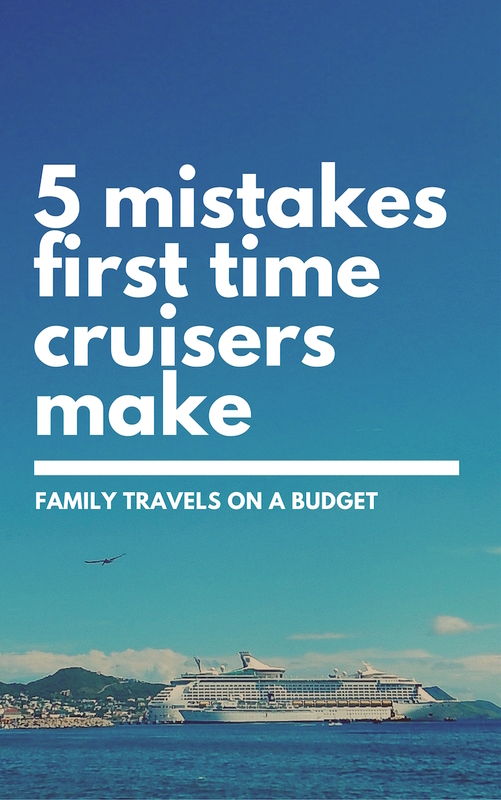 Share your tips to help first time cruisers avoid frustrating mistakes. Hi! I have enjoyed all the tip and advise. July will be my husband and I first time. We’re ggoing on Carnival Valor have looked on the cruise web site just reading. I have been a little confuse about the tipping myself.so I have a few qustions: 1- Do they serve water with a meal or will we be charge. 2- Are we allowed to take water and cokes onboard. 3- Can we use one card for the both of us to be charged or do it have to be separate. 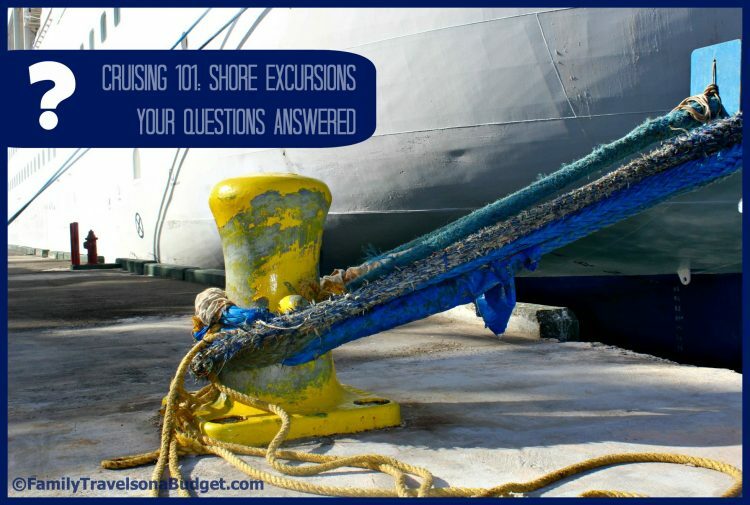 We’re not doing any excursions so that will save us there. This one is to get our feet wet for the first time. Teresa, I hope you enjoy your cruise! It’s such a relaxing way to vacation. 2. Carnival Cruise Line’s current policy for non-alcoholic beverages is: A small quantity of non-alcoholic beverages (i.e., sparkling water, sodas, juice, and milk) packaged in cans or cartons may be brought onboard on embarkation day and must be in the guest’s carry-on luggage. A small quantity is considered a maximum of 12 sealed, unopened cans/cartons of 12 ounces each or less per person. 3. You can put all your charges on one credit card, but you will each be given an ID card that you must use throughout the cruise. The photo ID card is your room key, onboard credit card (all charges will link to your room through your ID card) and is required to leave or re-board the ship in port. For example, if you buy a soda at the poolside bar, you’ll pay with your ship issued photo ID. The charge will link to the account you create before you board — so it can be on one credit card with your husband. Another example: As you go to leave the ship in port, you’ll line up at security and scan your ID. When you re-board, you’ll scan the ID again so the ship knows you are back on board! 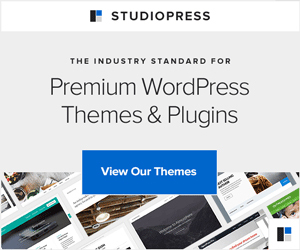 Fantastic articles found here! 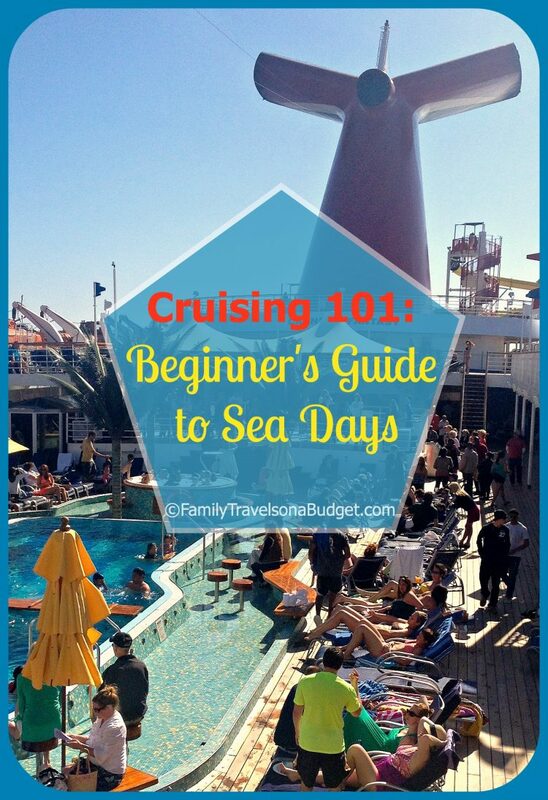 I have cruised many times, but always looking for helpful hints for the next cruise!! 1. Tipping (The cruise ships I’ve been on) for beverages weather it be soda, coffee or drinks carry an 18% gratuity already added. 2. You can find many cruises if you look closely that include drinks, gratuities and sometimes even OBC (on board credit). I always look for those. 4. You can save money by choosing a line when you cruise you add up the points getting discounts on beverage package, Laundry, and internet minutes. If you get their credit card you can get $2. for every $1 you spend on the cruise ship. I charge my cruise on my card and end up with about $300.00 worth of OBC to use on future cruises (depends on the cost of the cruise of course). Because I belong to there Captains club I normally get an upgrade when booking. 5. I always check with the onboard cruise desk to see if there are any specials on cruises for my next adventure. You can get some pretty significant discounts! You’re welcome! Are you cruising soon? Thanks for a great article. We’re going on our FIRST cruise as a family in July, and the information you provided was very useful. You’re welcome! Have a great trip. The first cruise is always the best! I would like to take a gift bag to give to our room steward the first day. What would be items I could include that would be most enjoyed by either male or female. We have cruised several times before and the stewards have always been excellent. This would not replace any additional tip at the end of the cruise. What a great question! Since you don’t know if you’ll have a male or female cabin steward or what they like, I’d keep it simple: chocolates (individually packaged), maybe something from your hometown (especially if your town/region is famous for something that is portable), a gift card to a superstore near your cruise ship port (so they can shop for essentials on their day off) — anything small like that would be really kind. What a kind and thoughtful idea! I love it! I usually leave our cabin steward an extra $20. Maybe I will pick up a gift card as well! We take our first cruise to Alaska in 38 days. My brother and his wife who cruise all the time told us that they take little bags of candy (along with money) to tip their staff with. They were told that the one thing that the majority of staff miss is candy. We intend to buy a bunch, bundle them up with a thank you tag on the outside and have them ready to give out to staff to thank them for services rendered. That’s awesome! I love knowing that there are so many kind travelers out there. When we recognize hard working staff, it just makes the trip better for everyone. Enjoy your cruise! My parents loved their Alaskan cruise. I’m still waiting to take one. 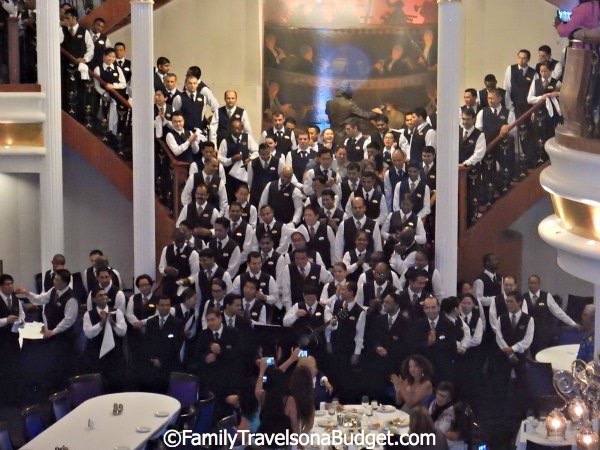 The most expensive unexpected costs for us on our first cruise were the formal photography pictures taken almost every night around dinner time. We took the pictures for fun and then, when they turned out so well, we wanted to purchase all of them – to a tune of over $300! We ended up being able to purchase the best ones on a thumb drive for about $125 and then printed them ourselves after we got home. But it was so hard to choose and know that the others would be just thrown away! Next time we will budget those into our expenses and won’t take photos at every opportunity- only on fancy dress up nights. Thanks for this helpful article! I am going on my first cruise in a couple of weeks and opted not to purchase the beverage packages. I only drink water and coffee and don’t think it would be worth it. I was wondering- do cruise lines have issues with bringing a 12 pack of bottled water on board? It depends on your cruise line. Use the links in the article to see what’s allowed or not allowed. If you are sailing with a different cruise line, then check with them. OR, if you scheduled through an agent, ask the agent. Sorry I can’t answer for you one way or the other. HI We are going on our first cruise this December. With the formal nights is it fine for the guys to just wear a button shirt with a tie and dress pants, or do they have to wear a jacket? For most cruise lines, like Carnival, Royal Caribbean and Norwegian, that would be fine. For higher end cruise lines like Costa, you would need to check. They tend to have more strict standards. Tipping on the cruise…my husband and I are each receiving a charge of $65 at the end of the cruise for gratuity covering the staff you mentioned above. Do we need to tip over and above this charge? You are not required to tip over and above that amount — that is considered the standard gratuity for wait staff (your waiter, assistant waiter and maitre’d) and your cabin steward. However, if you feel someone has gone above and beyond, you can add on to your tip on the last night. The cabin steward will leave an envelope on your bed the last night where you can adjust tips up for great service or down for bad service (rare). We generally start with an extra $20 tip in mind and decide from there where to go — up or down. If you purchase alcohol or other cash beverages (specialty coffee, soda) check your receipt to see if the gratuity is included — usually. If not, though, add a tip! You might also want a few dollar bills for unexpected things — assistance with luggage, room service, etc. Some very helpful tips. I’ve never been one to wear a tie, but I do wear a nice shirt and pants on formal nights. Our niece works on a cruise ship and most crew rely heavily on tips to help support their families at home. I do like that you can have gratuities automatically charged to your account as well. I take a large envelope. Each night I add up my receipts, bundle them in 1/2 write the date and accumulated amount on the outside stub and file the bundle in the envelope. Do this each night before going to bed and at a glance so can see how much you have spent and where. And if an item gets broken or doesn’t work later, you’ll also have reference information. I also do this at home and file my receipts in my monthly bank statement. At least I can laugh (or cry! ) when I see where all my money went. Fabulous tip! I keep my receipts in an envelope, but I don’t track as I go — though that’s the perfect budget travel tip! Thanks for sharing! How do you opt out and choose to tip daily? I’m about to go on my first cruise and am really confused about the tipping. Our cruise is a percentage accrued daily, so are you supposed to also tip everyone daily on top of that? No, Laura. The tip is factored in and automatically added to your bill unless you opt out and choose to tip daily. You have the option at the end to add on to your tip for exceptional service. Have fun! So glad I was able to help you prepare. 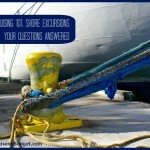 The most popular article on this site is how to pack for your cruise vacation. I hope you read it as well. Before our cruise, I visited a “consignment shop” and purchased a beautiful cocktail dress for a fraction of the cost of a new dress. It is an item I MAY use once more in my lifetime as I do not regularly attend formal affairs. I added a gold colored lace shawl as we were traveling in winter and matched my accessories and shoes to the shawl. My husband used his black suit with a shirt and tie to match my dress. We looked quite snazzy and didn’t spend a fortune. I saw people in the dining room that night in polo shirt, jeans and deck shoes. Some people have no taste in dress. I pay everything including excursions ahead. That way no surprises on board. I do pay tips at the end only because this is predictable and goes on the credit card and is a minor amount because I make no other purchases I do not have cash for. I bring a 12 pack coke on board and drink coffee, tea, etc. otherwise. Because I am not an alcohol drinker I do not get into that cost but my family members are careful to budget their beers into their budget. Another saving is my husband and my sister and I shared a room. we spend little time there and it cost him $179 less than half our fare of $419 per person for 7 days. He still had port charges and tips but it is a deal. I check the whole year and choose the cheapest week when we are planning. I also lucked out with half deposit and $25 per person room cash to use on board. A week before the cost was $50 more per person so shop for bargain fares. I also have a cruise fund where I put up $20 per week before I even decide on a cruise. Quite helpful if a friend asks you to come with them on a cruise. Lastly I buy trip insurance in case of medical emergencies-worth the $49-$65 dollar cost for my past cruises. It is based on cost of cruise. 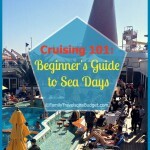 Nice explanation of how to save on cruising. Adding 3rd and 4th members to a cabin is a sure way to save! Great advice. good tips, i didn’t know that the tip was added at the end! that’s why i don’t really like paying with a card because you can’t really ‘see’ what you spend. Tips now can generally be prepaid (when you book your cruise) so you won’t have to worry about this at the end of the cruise unless your room steward and other staff made it worthwhile enough to add an extra tip. Very true, Renelle. Some people who don’t use the main dining room or have their cabin cleaned daily feel justified not tipping at all. The cabin steward does more than clean the cabin. The servers do more than serve dinner. I hope all will realize that tipping these hardworking people is important ~ whether you see them or not. I appreciate the prepaid option myself! It makes for easier budgeting. We just booked a cruise and we loved the paying for tips ahead of time. Now that’s one less thing to worry about. Are the prepaid tips for our room steward only? Who is that for specifically? Your prepaid gratuities are for everyone: the cabin steward, your server and assistant server, and the maitre’d.